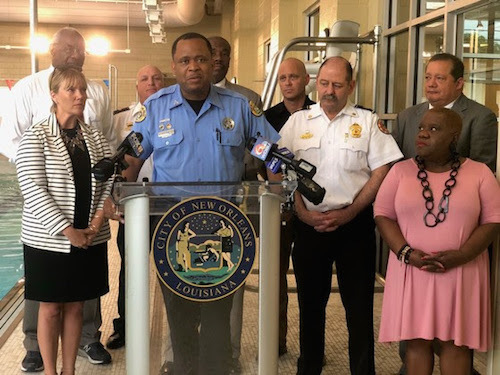 Leadership from the NOPD, along with NOFD and EMS, accepted a generous offer of free swim training for New Orleans First Responders at Dryades YMCA Aquatic and Wellness Center on Monday, June 4. In the wake of First District Officer Brian Frank rescuing a driver from flood water under the Carrollton overpass on Friday, May 18, local leaders demonstrated their commitment to First Responders by creating an initiative that gives officers access to the tools they need to serve and protect. Dist. B Councilmember Jay Banks partnered with the Dryades YMCA and the Helis Foundation to launch an aquatic program that will improve the officers’ lifesaving tactics. Officers will be allowed to receive free aquatic training at their leisure. The Dryades YMCA is also offering reduced rates for citizens interested in aquatics training. The NOPD advises all citizens to learn basic swimming techniques in case of an emergency. “I encourage all officers to take part in such a great opportunity. We are always working to be better and this program will give us the tools that we need to help our community,” said Officer Frank.